When I was growing up, planting the garden was a family event. I remember planting the seeds and being so excited when they began to sprout. As soon as the garden matured, my sister and I would raid the pea patch and pull carrots out of the ground, rinsing them with the garden hose before we ate them. Nothing tasted better than veggies straight from the ground and there was no shortage of garden vegetables between the two crops. When we bought our house I decided that it was time for me to start my own garden. My parents made growing a garden look a lot easier than it’s been for me. I have a hard enough time keeping my indoor plants alive so I was a little overwhelmed when I first started. Between reading gardening books, asking experienced gardeners (like Martha) for advice or just from my own trial and error, I am learning as I go. In my 3 years of gardening, I’ve discovered that I’m a real farm girl at heart and I find myself dreaming about having a big garden one day, and maybe even a goat! Since my gardening plot is on the smaller side I make a list of everything I want to grow then I plan my layout so it all fits. This year I plan to incorporate vertical planting to make more room for everything I want to grow. I prefer container gardening for my tomatoes, herbs and peppers. I’ll be planting my cucumbers in containers this year to help create space as well. The great thing with container gardening is that you can move them around if they require more sunlight or just for easy harvesting access. After I have my layout and have made a list of what I’m going to grow, I buy my seeds. I’ve already planted my peas, carrots, beets and spinach from seeds…and yes, I am excitedly watching and waiting for my first sprouts just like I did as a child. This is one reason why I find gardening so rewarding because I can actually see all of my hard work pay off as each vegetable grows! Certain vegetables grow better from transplants like tomatoes, peppers, herbs, onions and broccoli to name a few. Once the weather is warm enough, I buy my transplants from the greenery and get them planted. 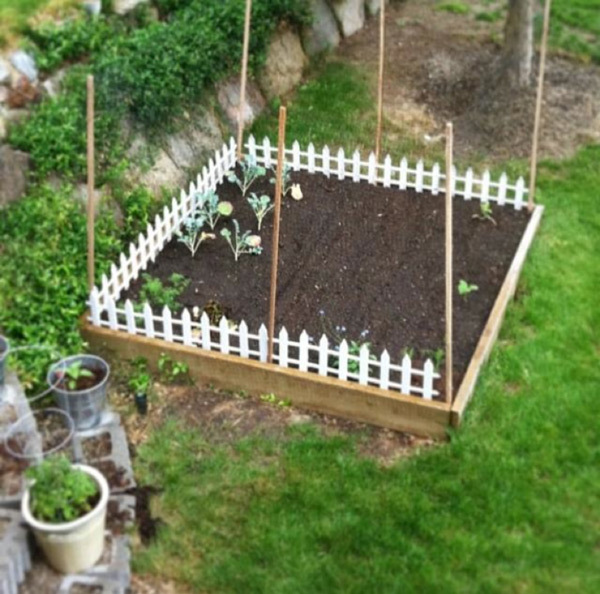 After planting, garden maintenance is pretty simple. Vegetables need water, but some need more than others at certain times. Once you learn how much water each vegetable requires, this part is easy! Weeding is another important job to stay on top of. It’s best to pick the weeds while they are young and before they go to seed and end up taking over your whole garden. Weeds compete for water and nutrients from the soil so it’s important to keep your garden as weed-free as possible in order to have healthy vegetables. We love our vegetables! I’m really looking forward to feasting on fresh vegetables this summer and making lots of delicious dishes. This Paleo recipe is inspired by one of spring’s first crops, asparagus! High in fiber, low in sodium and calories as well as a significant source of folic acid, potassium, thiamin, vitamin B6 and rutin. Asparagus is one of our favorite vegetables! In a small pot, boil asparagus spears for 3 minutes, then immediately place spears in ice water to stop cooking. In a large skillet, cook bacon pieces. Drain on a paper towel lined plate and set aside., leaving 2 tbsp of bacon fat in the skillet. Over medium-high heat, cook chicken in the bacon fat for about 10-12 minutes or until browned, turning once. Remove chicken from skillet and set aside. Heat oil in skillet over medium heat. Add onion, garlic and squash. Cook for 3 minutes, stirring occasionally. In a small bowl, whisk together the broth, tapioca flour, garlic powder and lemon zest. Add sauce to squash, cooking until thickened and bubbly. Add the chicken, bacon and asparagus back to the skillet. Cook for 6-8 minutes, until chicken is cooked through. Season with salt & pepper to taste. Add lemon juice before serving!